SHARE Guest Blog: Tv Tommy Ivo>> Fire! Fire! Fire! 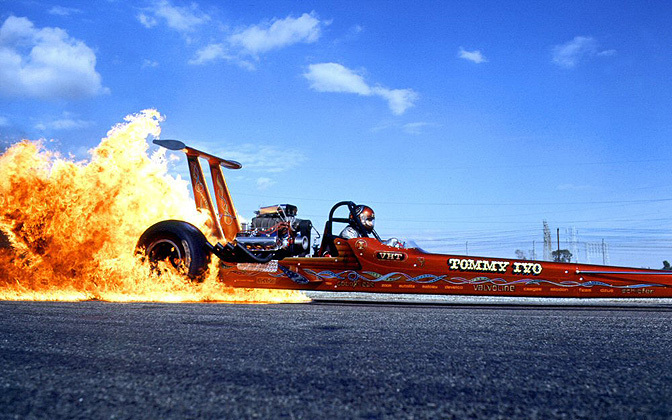 Guest Blog: Tv Tommy Ivo>> Fire! Fire! Fire! 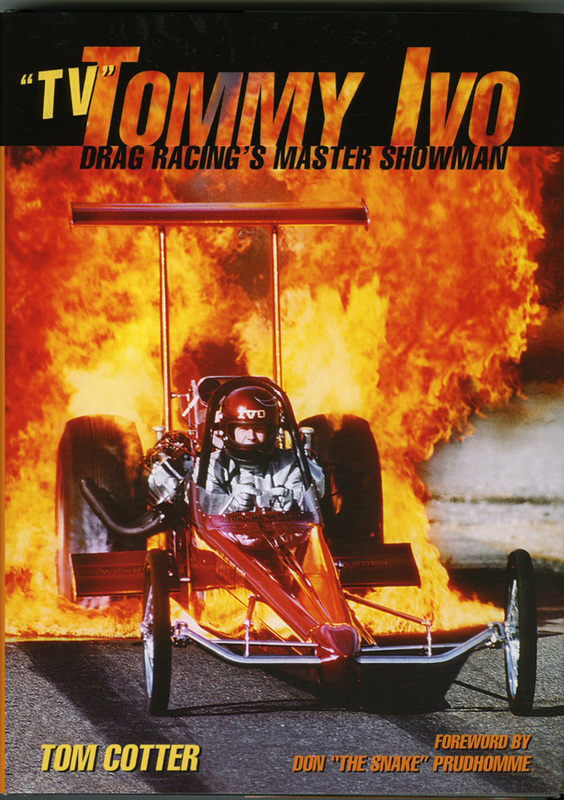 The fire burnout that adorns the cover my new biography book is the granddaddy of all fire burnout shots that we ever accomplished. We went down to the Orange County Drag strip and went way down to the far end of the shut off area. So as to not aggravate the surface of the asphalt with all the gasoline we poured on the ground, in order to achieve the desired effect of as much fire as a napalm bomb going off. You see, these fire burnouts were just an accident, the way we came about discovering them. At first, I called up the M & H Tire Company to get a new set of hides one day and he told me all the guys on the west coast were pouring down Clorox bleach in front of the tires to smoke them across the starting line, for a short burst of about to 50 feet or so and then backed up on to the hot rubber path they had just laid down on the surface, to get better traction on the initial launch of the car off the starting line. This did two things. Laying down a stickier surface on the track and also warming up the tires for a better grip as well. 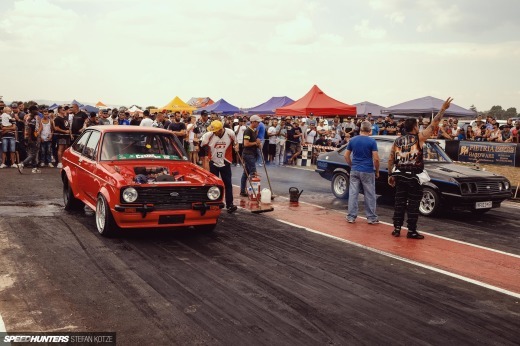 Of course as time went on, the burnouts got longer and longer, if for no other reason but for the sake of making a better show of it for the fans. 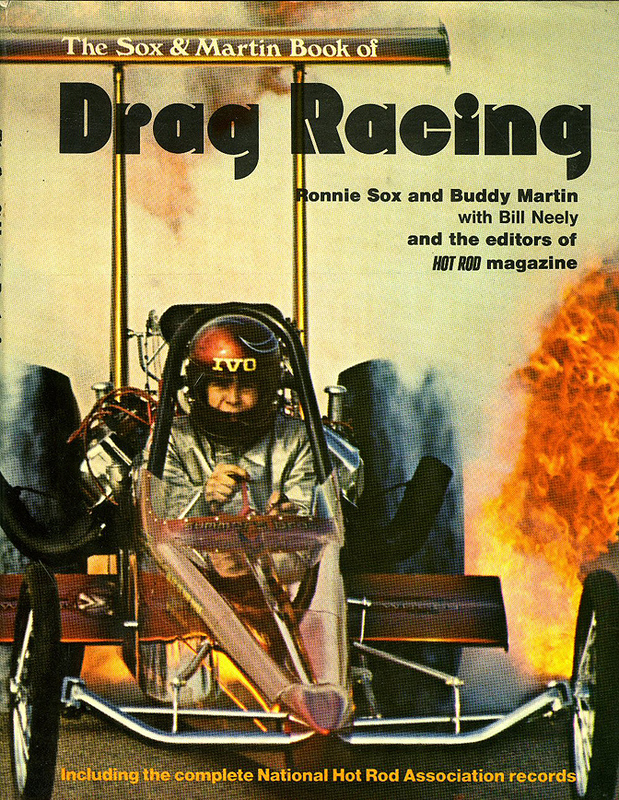 And TV Tom, Drag Racing’s Master Showman, (as they titled my book) did them to half-track and beyond at times! Then I roared back to the starting line at somewhere near the speed of sound, or so it seemed when you were handling the tiller inside that car going that fast backward. So then VHT came up with a special mix of fluid that used amongst other things, rosin in it. They got the idea from Boxers that used to put rosin on the soles of the shoes for better traction and sure footing. Back to the laundry closet went the bleach. 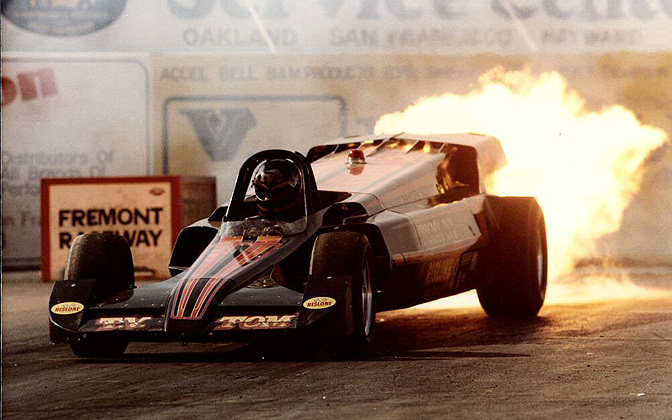 Then it all happened one night at Long Beach, when I was doing a burnout. The “ amongst other things”, that they were putting into the VHT came into play, because some of the fluid they used was flammable. We had just changed the headers on the car from the “weed sprayer” type, as we called them. That went straight down to a bend and made a 45-degree turn. They then released the exhaust parallel to the ground. We actually set the weeds that were growing along side the track of fire! The new “Zoomie” headers, as we called them, were made with a complete U shaped bend that pointed up toward the sky. This would create more down force on the tires, which again would add to the traction you could achieve for making yet more horsepower. This produced better ETs and thus, won more races. The first time I ran the Zoomies at night, there were two columns of fire standing straight up on both sides of the motor that I’d never seen the likes of before. I thought to myself, “Far Out Man” — it was the 60s you know!!! So later on that night, my crew guy was over amped with the excitement of the race, because we were in the final round for the win by then. He poured almost the whole bottle of VHT under the tires at one time. This in turn caused the tires to pick up an over abundance of fluid and fling it up into the air. 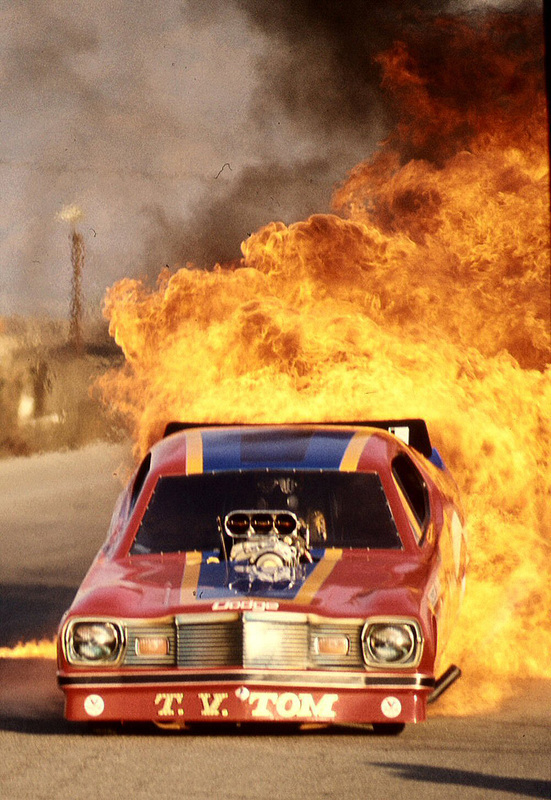 The fire from the headers then ignited the cloud of volatile fluid and it went off in a ball of fire and scared the living daylights out of me! In fact I cut the burnout short, but went ahead and made the run anyway. The guys with the tow truck came down to the other end to pick me up with eyes as big as saucers and said ‘did you see that?’ Boy did I ever! We then poured a little puddle of VHT on the ground, only to find out that it could be lit with a match. A light bulb when on over my head and I thought to myself. 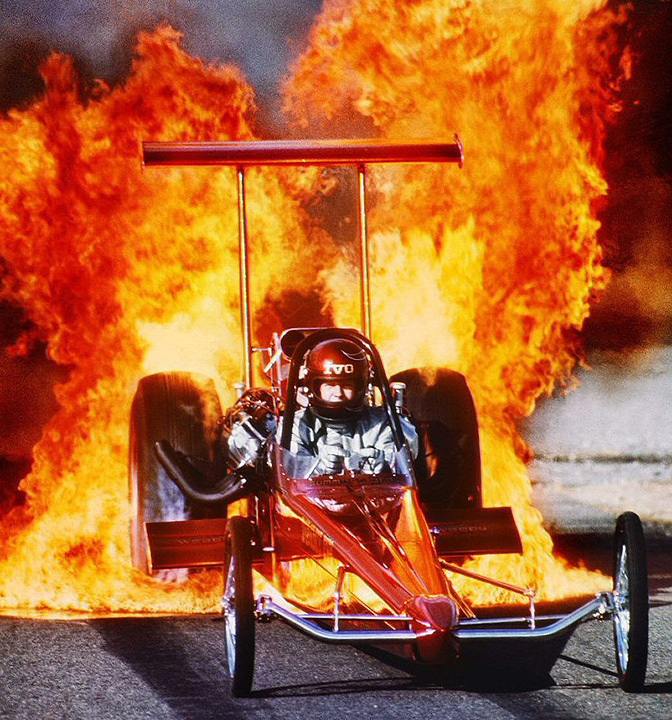 I wonder what would happen if we added some extra gasoline to the mixture — and fire burnout was born for me. 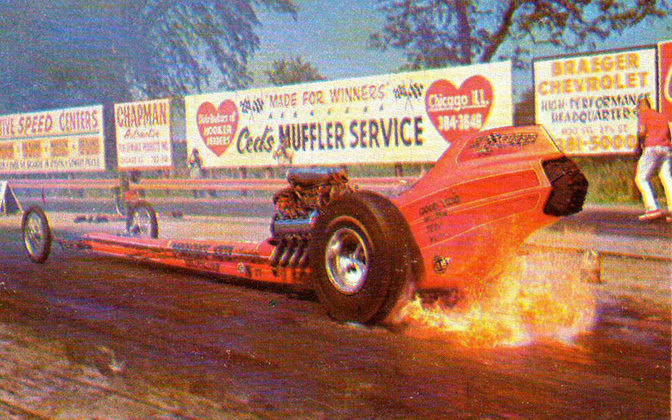 The only problem we had with early fire burnouts, was that it didn’t always work and was a hit a miss proposition. Porous tracks and side winds, etc. all had an adverse effect on the reliability of it. So, just for a little insurance policy we would slyly light the fluid with a match just before I took off. No one would notice this from the stands. The minute I saw flames, I’d put the pedal-to-the-metal and it appeared to be spontaneous combustion. But all good things must come to an end. 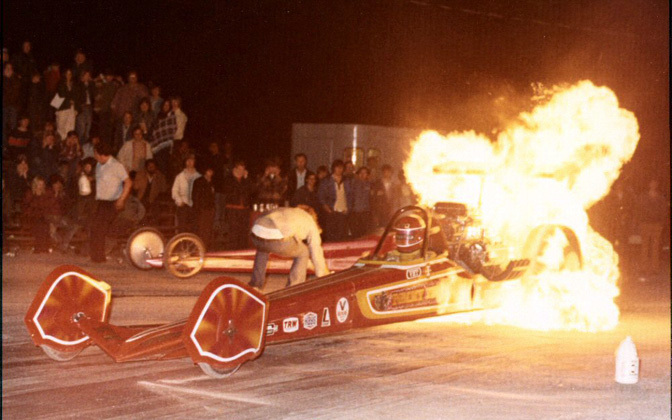 When local dragster guys, started doing it practically every run and the asphalt on the starting line was was really starting to get torn up from the gas attacking it. So that was the end of that. Plus they actually never did let you do it at any national events. But hold on, I’m not deterred that easily. We could still do it at the hole-in-the-wall tracks and then I could put a picture of it on my handouts. But it would have to be one heck of a picture that would do the trick! So we took my rear first rear engine car I’d ever had, down to Orange County raceway, dumped down a couple of quarts of gas out of a big necked jeep can and lit it with a match. 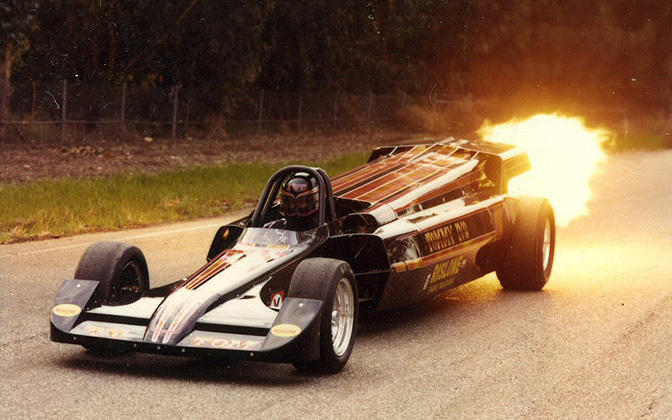 Those photographers had no idea I’d never driven a rear engine dragster before and were standing right next to the front wheels to get a good shot when I took off. If fact, I was so nervous that I forgot to put on my gloves for the first shot! When I asked the photographers how it looked and they gave me the side-to-side hand wiggle for a so-so sign. So I asked the guy pouring down the gas if he was afraid of it and should I get someone else to do it. That did it. On the next try, he emptied out all five gallons of gas in the can at one time and lit it. Now I had a guy that was put in charge of motioning to me when the fire was lit. Because of the sitting position of the new rear engine digger, I could no longer see the moment of combustion for myself. But he stood there and dropped his jaw. I figured out there was something drastic going on at the back of the car I nailed it. I was a good thing I was prepared for this. We had taken the parachute and pack off the car, because nylon and fire don’t mix. Plus I had caked the body with Vaseline, so no matter how big the fire was, I wouldn’t scorch the brand new paint. It worked out better than I expected because I got a half dozen magazine covers out of it as well. 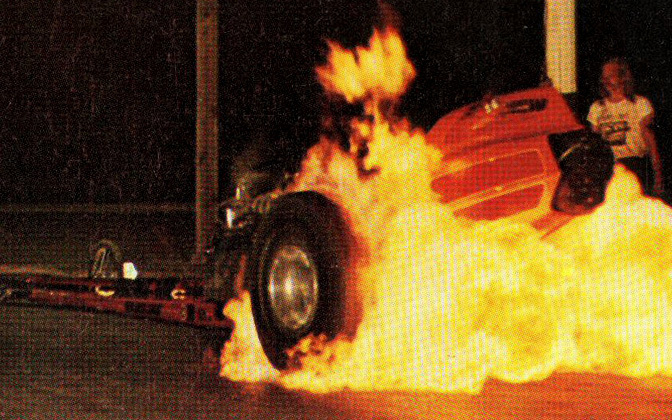 We did the same thing with my funny car, but the body hanging over the tires took some of the inferno look out of it. But the fire ran all over under the car, because I could see flames as far forward as both plastic fire windows we had in the firewall. They were installed there to see if you had a fire in the engine compartment during an engine frailer on a regular run. 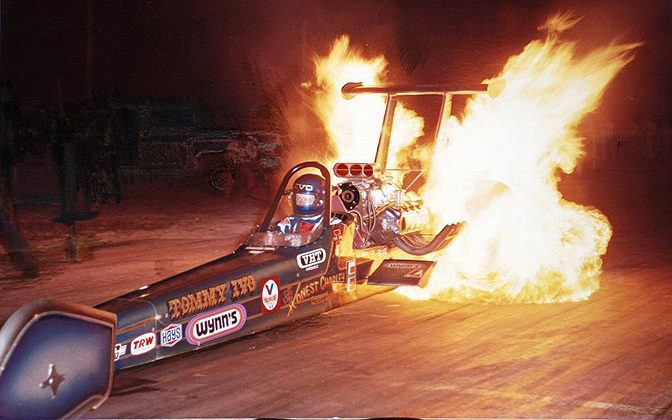 One of the things that drew me to jet cars was the fire show you could put on with them and it wouldn’t hurt the track at all. If you left the engine idling and turned on the after burner and hit the spark starter, it would put a huge ball of fire out of the back of the tail pipe. This was really amusing to me, when we ran the car at night. Because when you would turn the flame on for the first time, it would be all dark in the stands when I looked up there. But the next time I’d light the flame, it would look like there were 5000 Cheshire cats smiling at me from the darken stands. I could literally see the reflection of all those smiling teeth bouncing the light back at me from the fire reflection. Plus, it was legal to do! We’d have to sit back from the starting line somewhat in the staging lanes that were all cleared out already, do to the windblast of the jets when they were running. This was because where the fire would touch the ground for to long a period of time. It would leave a fine powder dusting of singed rubber from the heat, when we got too exuberant with a long fire show. 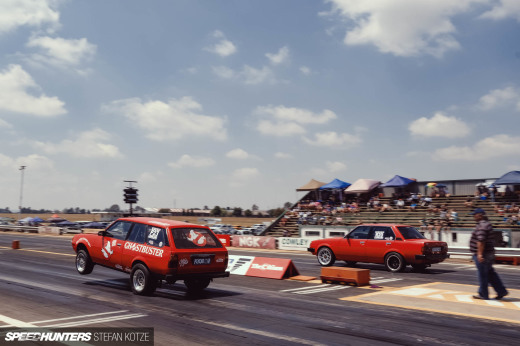 This course was blown away immediately, when the next cars would all start pulling up and the exhaust blew it away. Well I “thinged” him one. On my next pass, just before he ran. I pulled all the way up to the starting line and turned the fire on and left it on for a good long time. And when he came up to the make his run, it was an ice skating rink and he went every which way but straight. I’ll “THING” him one. He never knew what hit him — I guess he does now. Coolest feature on here in a long time. Love it. Cool. 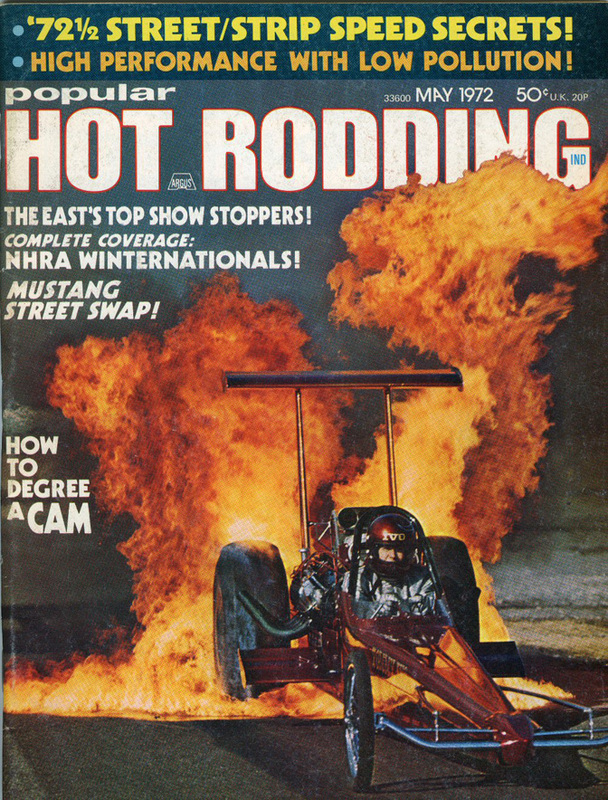 Love the "ice skating dragster" story. What a pleasure to read these insights. all from the great man himself! Goddamn, Tommy Ivo, you are a MAN. 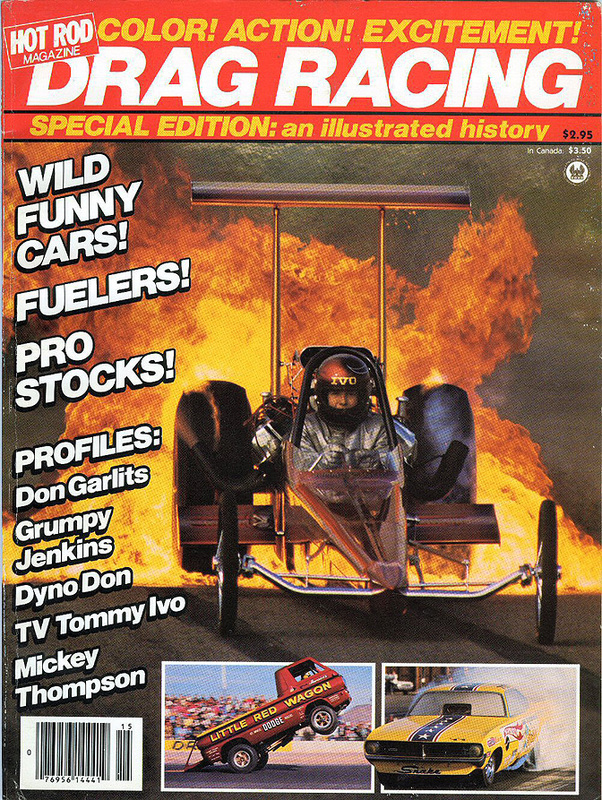 I reckon that jet-car looks cooler than the ones they drive these days. Interesting article, but if the grammer in his book is anything like this, forget about reading it. I'm reading the book now - it's great so far and a really good insight into the way they did things back then.